LOLTHULHU » FOOL! 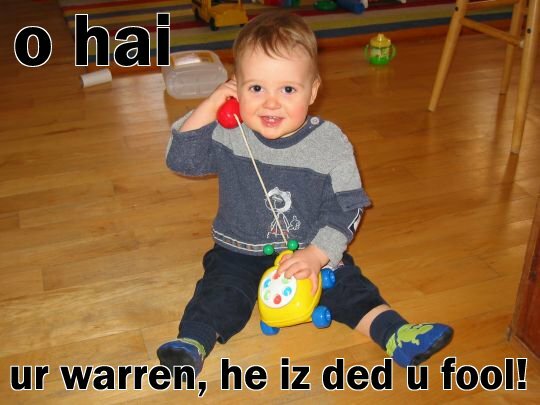 UR WARREN IZ DED! FOOL! 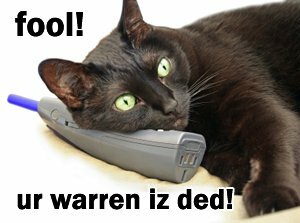 UR WARREN IZ DED! 8 Responses to FOOL! UR WARREN IZ DED! Perfectly captures lolcats.com and the ending of “The Statement of Randolph Carter” … I love the cat’s fearful expression. O NOES! HE IZ DEAD? U EATED HIM? WHUT? U buy me a new Warren nao! I is from Ulthar… You has a flavor? This has to be one of my favorites, along with the noneuclidean sweater and the rats in the walls. The ones with actual catz in the pictures are great… maybe because HPL himself loved them so much. I can picture him talking to his cats and talking back for them just like that. Lol I was just reading that story like two days ago! Shortage of Randolph Carter lolthulhus ^.^ the caption sent a shiver through my heart.